The 1986 Elfstedentocht passes through Franeker, one of the Frisian cities linked by the Eleven Cities Tour. 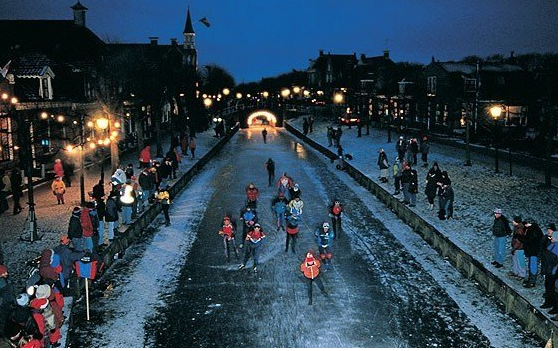 The Elfstedentocht, which means 11 Cities Tour, is a 124-mile speedskating marathon linking 11 Frisian cities via the canals of the northern Netherlands. It is a Dutch cultural and sporting touchstone. I am forever grateful I had the good fortune to be there as a journalist in 1986, and it led to a story that always will be one of my favorites, as it gave me a chance to blend sport, culture and anecdota in a way that was hopefully enlightening and entertaining. There also is a nice story behind my story, and, seizing on the opening provided by Keh’s, now it the time to tell it. My base for the month-long reporting trip (with some vacation mixed in) was the Brussels suburb of Tervuren, where my Fulbright Scholar wife was living for several months while doing research for her Ph.D. dissertation in the history of art. Early in the final week of February, I got a call in Belgium from a Chicago Tribune editor who had a fine sense of what could make a good story but a lesser grasp of European geography. The Dutch consulate in Chicago had called the Tribune with the news that an Elfstedentocht would take place two days later, pitching the story by explaining what the event means to the Dutch as a cultural legacy (Hans Brinker and all that); noting that what would later be called climate change had made the event rarer and rarer; and saying the consulate would help with 11th-hour logistical arrangements if the paper were interested in sending a reporter. A day later, I was driving the 225 miles from Brussels to Leeuwarden, the city in the Dutch province of Friesland where the Elfstedentocht would begin well before dawn on Feb. 26, 1986. The consulate had arranged a credential and a bed in a local house and a way for me to follow the event – part elite race, part everyman (and woman) adventure - by riding with two British photographers. I didn’t get to see Katarina Witt in 1986 but did many times later - including the 2018 Olympics. As soon the bureaucracy after my arrival was out of the way, it was time for me to join a traditional Elfstedentocht eve celebration called The Eleven Bars Tour. (I wimped out after about four.) And as for the bed, I didn’t spend much time in it, what with having to be ready for the race’s start at 5 a.m. and having to sleep in my clothes, since my otherwise generous host was, shall we say, frugal about using heat. When the sun finally came up, low on the flat landscape, it gave my British photog colleagues a moment that could only be described as transcendent. They had scouted locations and sunrise timing and found a place where a long lens would foreshorten the image to have skaters passing through the sun. I think they still are smiling about the photos they got. I left Leeuwarden in early evening for the drive back to Brussels. As I passed through sparsely inhabited farmland, the night was so clear, the stars so bright that if I knew how to work celestial navigation, I wouldn’t have needed road signs. It was as if, after a magical and almost otherworldly experience unlocking the singularity of the Elfstedentocht, the universe wanted to reveal further mysteries to me. And as to that purported thing with Katarina, that’s quite the mystery story, too. Here it is.